Please refer to our stock # 631 when inquiring. 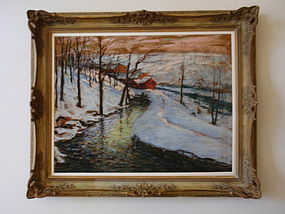 Winter Landscape Pastel by Fred Wagner image size 20" L x 26"W. overall framed size 27 x 33. Signed lower right. Wagner exhibited at the Pennsylvania Academy over 35 times from 1906-1940, winning prizes in 1914 and 1922. Wagner exhibited at the Carnegie 14 times from 1898 - 1925. He showed two works at the Armory Show, and exhibited 11 times at the Corcoran between 1907 - 1935. He had a special exhibit of 100 pastels, at the Corcoran in April 1924. Wagner exhibited at the National Academy of Design in 1884, 1907, 1925 and 1928.